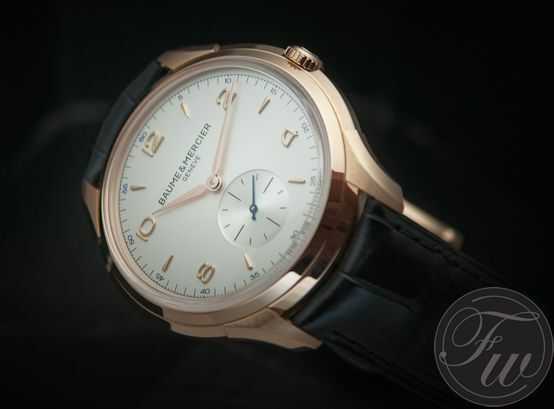 Baume & Mercier brought one of the biggest surprises during the recently held SIHH by introducing the Clifton. Although Baume & Mercier already had sent out press releases to announce this new collection, I didn’t want to say much about it before seeing it in the flesh. The Baume & Mercier Clifton collection grabs back to their watches from the 1950s. Elegant shaped cases, long lugs with perfectly beveled edges, a domed sapphire crystal and applied numerals and hour markers. The inspiration for the Clifton is clear. 1950s timepieces from their own collection from that era. During my interview (that will be published later on) with Baume & Mercier’s Alexandre Peraldi (design director), I’ve learned that they also used input from their watch makers and long time retailers to create the Clifton collection. When creating a timeless classic based on watches from the past, you can do a lot of things in the wrong way. It is very difficult to create a watch that breathes the same atmosphere as these true vintage 1950s watches without having either a ‘little old grandfather’s watch‘ feel to it or a watch that should look 1950s but has too many modern influences in it. Although the pre-SIHH press release photos were already promising, I was truly stunned when looking at the Clifton collection in the flesh. Baume & Mercier exactly hit the right 1950s spot with their Clifton, especially the Clifton M0A10060. Baume & Mercier introduced 3 different Clifton collections that consists of 9 different executions. For now, let’s focus on the Clifton M0A10060, their flagship model of the new collection, also being referred to as the Baume & Mercier Clifton 1830. First of all, as written above, the watch definitely has that 1950s feel to it. Although it is not the typical 34 or 35mm vintage sized watch case but a ‘whopping’ 42mm. I always wonder whether the watches in the 1950s on our parents and grandparents were also small on their wrists (and we just became a bit bigger) or whether it was just ‘normal’ to have a very small watch, even if you had large wrists. Somehow, small vintage watches look very well on the original owners/buyers, but not on me. I really adore these old vintage 34mm and 35mm watches, but every time I am persuaded in buying one off eBay or Chrono24, it ends up in the safe because it looks too small on me. The 42mm sized Clifton looks just perfect on my wrists. With a height of just 8.85mm, the watch sits ‘flat’ on the wrist and ensures that it doesn’t become bulky or looking like a sports watch sized timepiece. The domed sapphire crystal and long bended (and beveled) lugs also do great job making this watch look like an elegant object on your wrists. This flagship model Clifton comes only in one shape and color. An opaline silver-colored, domed dial (!) that looks a bit ‘creamish’ from certain angles and with certain light sources. Gold hour and minute hands and a blued small second hand have been perfectly chosen for this watch. The shape of the hour and minute hands is just beautiful and seems to be a combination of leaf shaped hands and dauphin hands. 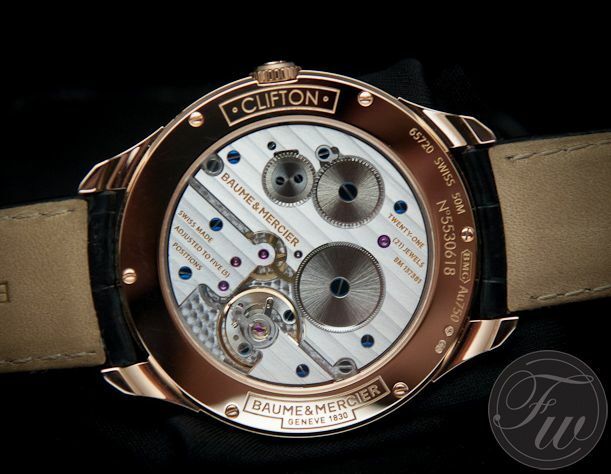 Inside the Baume & Mercier Clifton ref. M0A10060 ticks a hand-wound mechanical movement manufactured by La Joux-Perret, caliber 7381. With a power reserve of 90 hours, you don’t have to go to the process of winding it every day which seems to be a hurdle for some people who want to buy a mechanical watch. So, not a single downside of this watch? Well. First of all, the watch has a certain price tag. This particular Clifton only comes in a 18 carat red gold case. The other Clifton models are made out of stainless steel and have an attractive price tag (starting at 2500 Swiss Francs). I am not saying that it is too much money for this watch, but for 12.000 Swiss Francs (excluding VAT), there are a number of interesting alternatives people can choose from. Another point is its movement. Personally I wouldn’t be bothered by it, but the La Joux-Perret movement manufacturing company has been acquired by Citizen. To be more accurate on this, Citizen bought the holding company of La Joux-Perret, Prothor. The downside is that Citizen doesn’t sound very Swiss, the upside is that La Joux-Perret has enough capital strength to be sustainable for years to come. 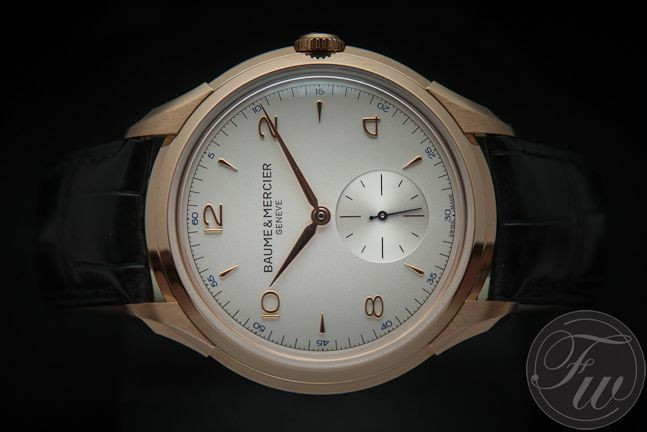 In the end, Baume & Mercier did a fantastic job with the new Clifton collection. Personally, I find this 18 carat red gold version the most attractive Clifton. The Clifton 1830 comes on a very pretty black alligator strap with a red tang buckle. All photos can be clicked for larger versions. Article written by Robert-Jan Broer for www.fratellowatches.com.